The re-debut of Metal Gear Solid 3 as a Nintendo 3DS game later this year will also signal the debut of a new version of Nintendo's handheld. Technically speaking, the new 3DS will function identically to the systems available since Nintendo launched the machine early last year. Aesthetically though? Tactilely? That's an entirely different story. 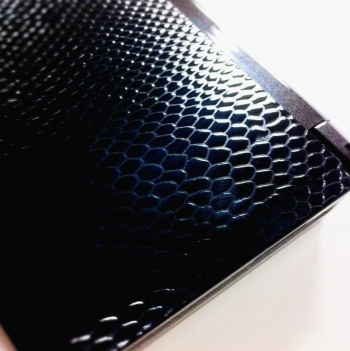 To indelibly tie the new hardware to the game it's meant to promote, the console's case has been redesigned to feature what Andriasang dubs "the industry's first snake pattern embossed design." In layman's terms, that translates to "your 3DS looks like a snake, bro." Though a Kojima Productions tweet was the first mention of the new design, Hideo Kojima later clarified the concept and offered that image you see embedded at top-right as an example of what exactly this serpentine gaming machine would look like. And yeah, that pretty much looks like a snake (or haute couture console design straight out of PETA's worst nightmares). We still don't know when exactly Metal Gear Solid 3DS, or this reptilian handheld, will hit store shelves, nor what price point the duo will see, though Konami claims that full details should be appearing later this month. Normally I'm a bit non-plussed by recolored promotional consoles, but this design is pretty rad. And I'm not just saying that because I've got a worrying fixation on the color black. Embossed scales is a simple concept, but thematically it fits the game quite well, and until some dumb kid takes the game's title a bit too literally and attempts to swallow his, it seems like a pleasingly subtle way to promote the game's existence.